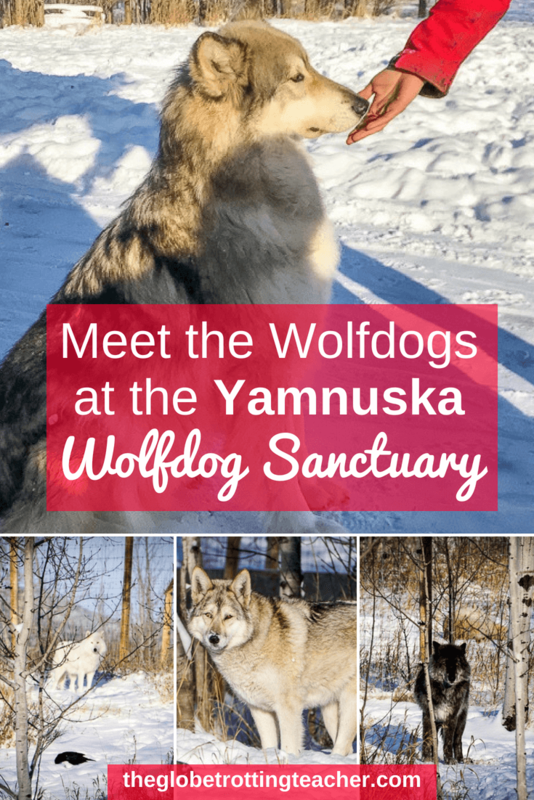 The Yamnuska Wolfdog Sanctuary is a nonprofit organization that takes in rescue wolfdogs, from the high content wolfdog to the low content wolfdog. These are wolfdogs who have been otherwise neglected, displaced, or abandoned. 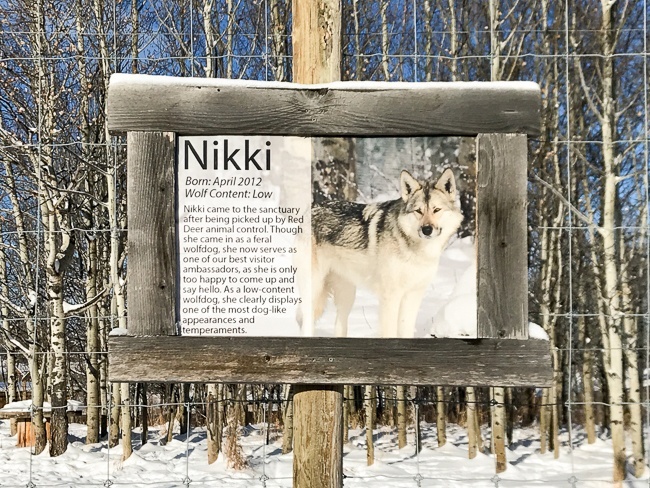 Located an hour east of Banff, Yamnuska Wolfdog Sanctuary in Cochrane, Alberta Canada offers visitor tours where it’s possible to walk through the sanctuary and even interact with the wolfdogs. Along the way, a knowledgeable guide explains the differences between wolves, wolfdogs, and dogs, as well as why wolves are so important in the wild landscape. 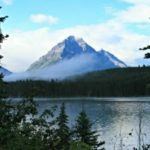 If you’re spending time in the Canadian Rockies and were hoping to see a wolf, you’ll have to get extremely lucky. 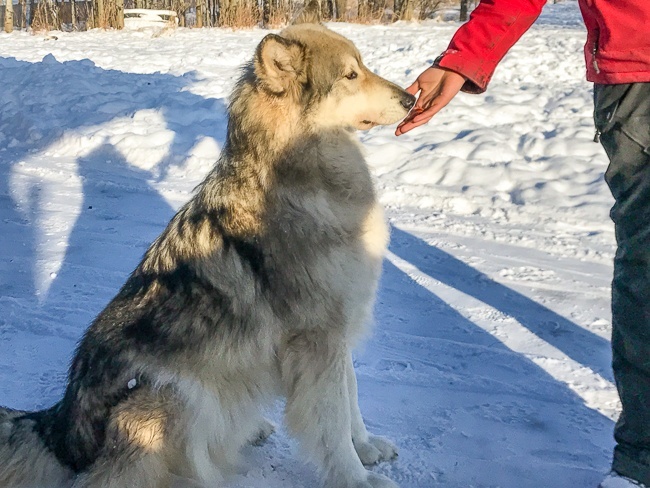 But, you can do the next best thing and interact with wolfdogs by adding a visit to Yamnuska Wolfdog Sanctuary to your list of things to do near Banff National Park. If you’re someone who has dogs for pets, you may have looked at your cute, cuddly fur-baby and wondered how on Earth it’s possible this loveable little creature descended from wolves. Certainly, a lot of history and genetics has happened over a long period of time to where we now have everything from Italian Greyhounds (my babies!) to Labradoodles. However, the wolfdog, by definition, is a hybrid between a domestic dog and a species of wolf. These dogs fall into somewhat of a gray area. On the one hand, breeders sell (supposed) wolfdog puppies, while laws in many places classify them as a wild animal and/or prohibit them to be kept as pets. The result is the need for a place like Yamnuska. Either owners are prevented from keeping their wolfdogs or realize their cute puppy has grown into a pet not suited to their lifestyle and/or is aloof and difficult to manage. So, I was glad to have booked an interactive tour to learn more about wolves, wolfdogs, and dogs, not to mention, the opportunity to get up close with the wolfdogs themselves. 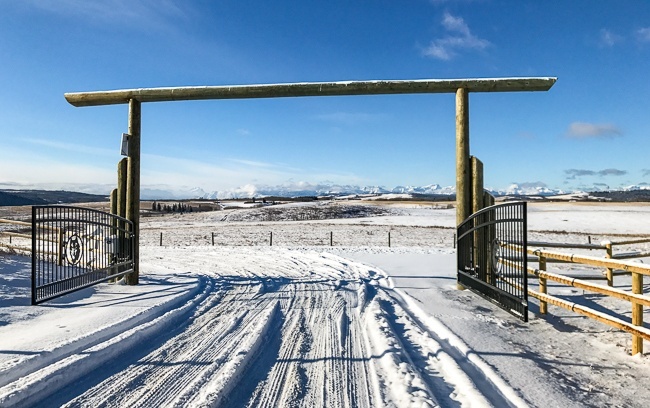 With Alberta’s open-expanse between Calgary and Banff in the foreground and the looming peaks of the Canadian Rockies in the background, we pulled into the long driveway leading to the sanctuary. Black wolf silhouette placards lined the fencing. The air was crisp but the sky was bright blue. Stepping out of the car, the wolfdogs welcomed us with their howls. Entering the main office, we were greeted by a large malamute. She greeted us by wagging her tail and nuzzling into our legs. We later learned just how dog-like this is, but at the time we didn’t know if she was dog or wolfdog, just enormously friendly! The tour began just through the other side of this building where the wolfdog enclosures came into view. With a center walkway leading to other smaller pathways, we noticed packs of 2-4 wolfdogs in large open pens. 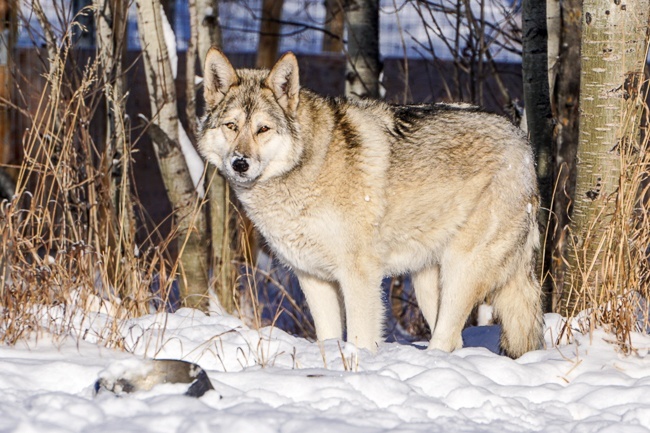 Yamnuska Wolfdog Sanctuary prides itself on having large 1-2 acre enclosures in a natural setting with carefully considered pack arrangements. After going over a few dos and don’ts, the guide led us into a fenced-off pathway and into one of the enclosures with 3 high-content wolfdogs named Kuna, Zeus, and Nova. As our small group settled into a benched seating area, Kuna came to greet the guide while Zeus and Nova scattered to the far reaches of the enclosure. Knowing how rare it is to spot a wolf in the wild, it was thrilling to see Kuna and the others in such close proximity! Zeus checking us out from afar. The guide gave us a handful of treats and began to explain what was meant by high content wolfdog. Kuna lingered near the guide for a few moments, perhaps thinking about the treats in our hands, but then retreated back toward the other 2 wolfdogs. It was still enough time to admire her golden eyes, her long legs, and her coat of blended black, white, and golden brown hair. The sanctuary uses a process called phenotyping to determine who much wolf or dog each wolfdog has in their blood. By observing physical features and behavior, a determination is made. So, high content wolfdogs look and act more like wolves than dogs. I realized I’d never really noticed some of the truly distinctive features separating wolves from dogs, but as the guide explained it was easy to see the differences. Their long legs set close together combined with a leaner frame were built for traveling long distances and speed. In addition, these wolfdogs were acting more like wolves, displaying their instinctive reaction to move away from people rather than seek them out for attention and affection. Our guide walked up around the wolfdogs and tried to coax them closer with some treats. However, they weren’t interested and I was glad to see the guide respected their wishes. Nova wasn’t interested in any of the treats we had to offer. In fact, all through our visit, the sanctuary proved itself to be a safe-haven for the wolfdogs and a place of education for the humans. The staff was incredibly caring and knowledgeable. These are key signs your travel-animal experience is ethical and puts the animal’s interests first, above all else. Once again seated, the guide pointed out the differences between these wolfdogs, compared to the ones we had just left. Loki clearly adored the spotlight and went down the line of visitors for treats, allowed us to pet him, and even shook paws with us. Rue was a bit more hesitant but did selectively make her way over to say hi and take a treat. She was gentle and had loving eyes, but we stayed within her comfort level and did not reach out to pet her unless she wanted it to happen. Seeing Rue, who is more wolf, and Loki, who is more dog, side by side made it really easy to see the physical characteristics and the levels of trust with humans that defined each one. Wolves have been hunted by humans for centuries teaching them to distrust and run from us. While dogs, on the other hand, have learned to stay close to humans. These instincts played out in front of us like a biology lesson. As the tour wrapped up, we said our goodbyes to the wolfdogs. We were able to freely wander the open pathways past other enclosures. Each one had signs with the wolfdogs’ names and content levels. There were also fact signs to teach more about wolves and wolfdogs. Toward the end of our visit, something stirred the wolfdogs and their howls echoed from all around the sanctuary. After all, dogs bark, but wolves howl. It couldn’t have been a more fitting finale to our up close, truly original wolfdog experience. The sanctuary is open Thursday-Monday from 10 am – 5 pm. 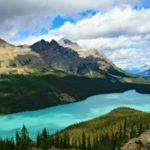 If you’ve rented a car, no need to join a guided tour from the Banff area. 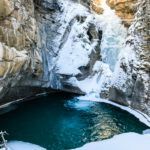 The scenic 1-hour drive is straightforward and mostly along the TransCanada Highway. If you’re heading to Yamnuska from Canmore, the drive is about 40 minutes. There are 3 options for your visit. All money made from the tours and visitors goes toward caring for the wolfdogs. 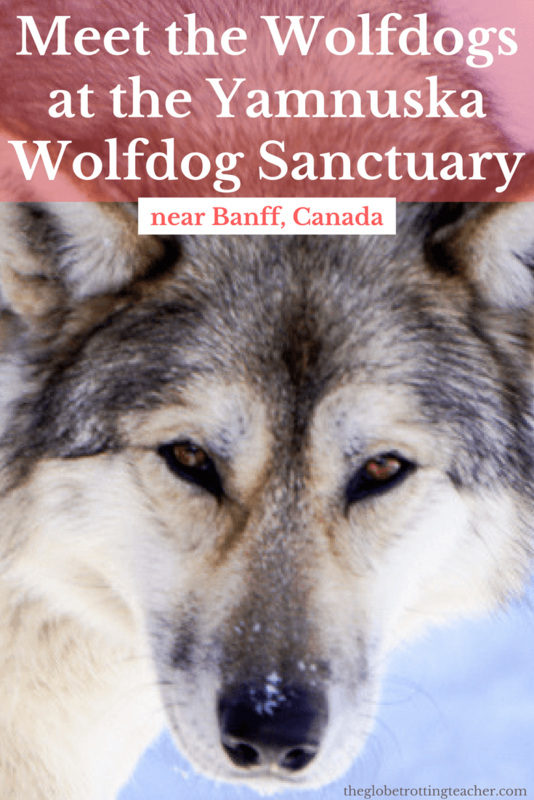 The Sanctuary Walk is a self-guided walk along the open pathways of the sanctuary to view and read about the wolfdogs in their enclosures. No reservations needed. 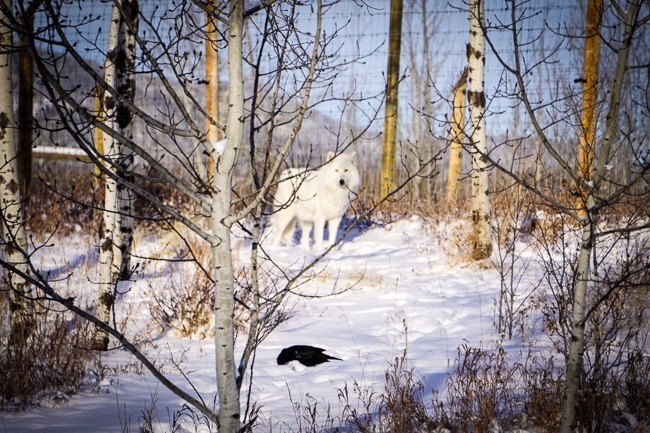 The Intro Tour is a guided walk through the sanctuary with one of the wolfdog experts. 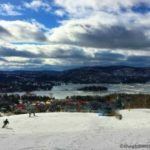 Reservations are not required but large groups may want to confirm availability before making the drive. The Interactive Tour (what I did) allows only 6 people per tour, so be sure to make advance reservations. An expert wolfdog caretaker will take you into the enclosures to learn and interact with the wolfdogs. The sanctuary does have age restrictions for each tour so read the details of each visit option carefully. Either way, the wolfdog sanctuary is not right for children 5 and under. 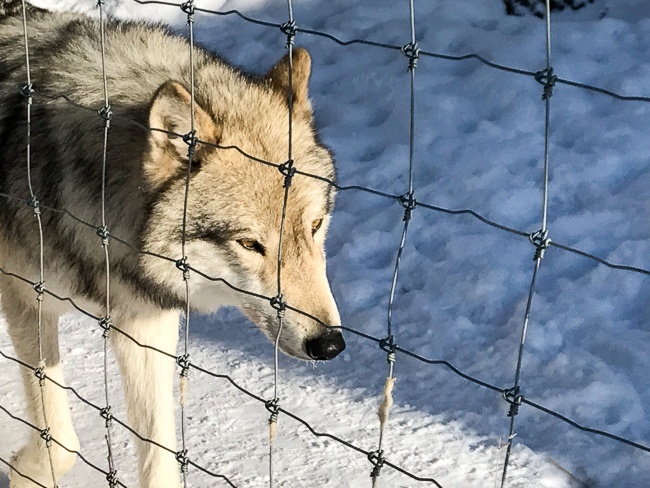 After spending a few hours at Yamnuska Wolfdog Sanctuary, animal-lovers will not soon forget the wolfdogs’ golden eyes, instinctive howl, or what it feels like to get up close with nature’s closest genetic match to wolves in the wild. 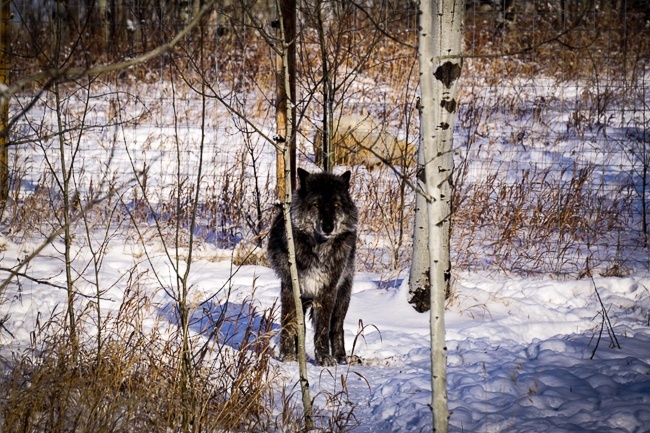 Would you like to meet the wolfdogs at the Yamnuska Wolfdog Sanctuary? Save this guide for later! Pin it! Love this! I just got back from Portugal and visited the Iberian Wolf Sanctuary. I also found another article recently about the differences in Wolf Dogs and Wolves. I too, find it soooo interesting. I am currently putting together a list of animal sanctuaries in my blog and did not know about this one. Thanks so much!! I had no idea wolfdogs were a thing! This sounds like a great way to learn about them. If many of them are at the sanctuary because they can’t really be kept as pets, do they ever pose a risk to people? Thanks for reading, Carrie. They can be difficult pets particularly because people don’t truly understand their needs and how different they are from regular domestic dogs. For example, the higher-content wolfdogs won’t be as affectionate and social with their human caregivers when compared to dogs. And, some places have rules about ownership or even the type of containment allowed. Our guide used the example of fencing. A wolfdog may be able to leap over a 6-foot fence, but the neighborhood doesn’t allow fences over 6 feet. But as far as safety, the sanctuary did a great job of making the dogs and the visitors safe and comfortable. That is so cool! I did a similar tour (only for full-blooded Gray, Arctic and British Columbian wolves) at Seacrest Wolf Preserve in NW Florida. The wolves were so smart and gorgeous. We got to interact with them which was a little scary at first. They are such smart animals. Your tour looked very fun! Oh, your visit to the Wolf Preserve sounds amazing, Melody. Is that the one in Panama City? I almost visited years ago and was bummed to miss it! What a wonderful encounter with the wild. I’ve always admired Huskies who are the closest I’ve seen to a Wolf Dog. 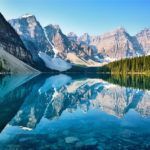 Would love to visit the Sanctuary near Banff one day. Thanks for sharing this! How interesting. 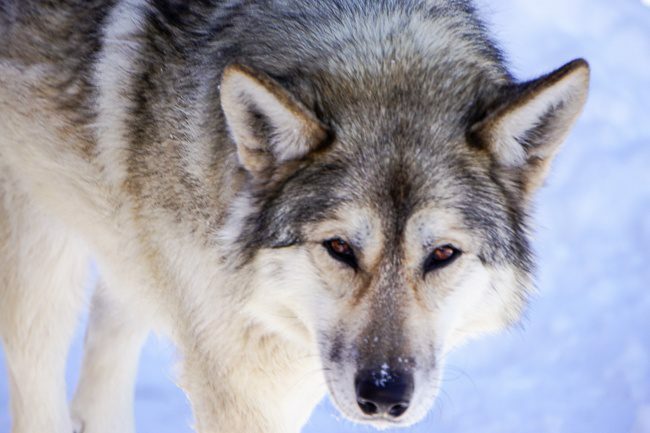 Did not know about wolfdogs…fascinating read. 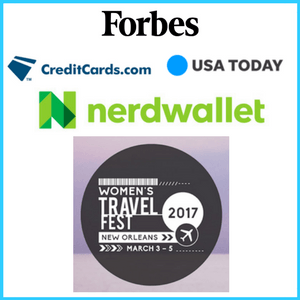 The tours sounds like a really fun experience and opportunity to learn more. I’ve never considered such a tour, but I’d certainly be open to taking one in the future! Great read! Thanks, Alli. It really is an original experience. 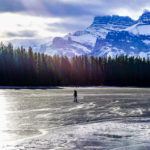 If you’re in the Banff area ever, save a morning or afternoon for a visit. It drives me nuts when people think they can mess around with wild animals – and breed them with domestic pets. It is a shame this sanctuary has to exist but I’m glad these animals have somewhere safe to live & be cared for properly, with the right amount of interaction (or not). Are there any wolfdogs in the wild or would they not be able to survive? They are beautiful animals, and wolf or dog and a fascinating experience for sure! That’s the thing, Claire. These dogs are kind of in a gray area. They couldn’t really survive in the wild but also truly need the right kind of owner/lifestyle to be successful in a domestic setting. Luckily, the sanctuary is there to help them have as normal and happy a life as possible. Oh my gosh! This is so magical! I love dogs and getting to play with wolf dogs almost seems spiritual! I would want to do the interactive tour so I can play with those cute wolf-pooches! The interactive tour is definitely the way to go if you want to get up close with the wolfdogs, Paige. I’ve heard about this sanctuary a while back but didn’t know it is so close to where I live! I didn’t even know people can keep wolfdogs as pets in Alberta. Sad to learn that they had a rough past, but happy that they are rescued and being taken good care of now! The sanctuary is doing a good job to take care of the wolfdogs and educate its visitors. Hope you can stop by for a tour some time, Cat. First of all, I didn’t know that there was something called a wolfdog! Such an interesting breed of animals to know. Loved how you have laid out the details about the wolfdogs. It must have been a great day spending time with these lovely creatures and getting to know them. I just love dogs, and I would want to visit this someday on my trip to Banff. Great post! It sounds like Yamnuska Wolfdog Sanctuary is doing some amazing work. I feel bad for a hybrid like a wolfdog who is caught inbetween both worlds – not really suitable for domestic life, but not able to really cope in the wild after they’ve been domesticated and then abandoned. The dogs truly are incredibly beautiful – and I’m glad to hear that the sanctuary is truly a sanctuary – an ethical wildlife experience, and not forcing the animals into a human experience is that’s not what they’re interested in that day. Will include this on my Canadian bucketlist! I thought the same, Meg. That gray area between wild and domestic animal is just so hard. The more I learned, the more I was glad for a place like Yamnuska Sanctuary. Hope you can visit when you’re in Canada.